This week it's been all about Asheville here on the blog and we kicked it off with some amazingly yummy food! 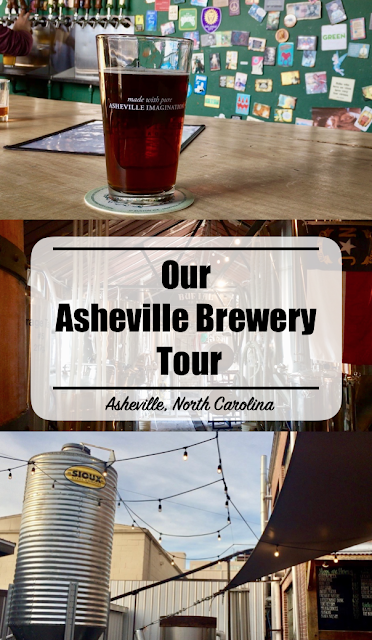 Today's it is all about the boozy side of Asheville... come join us for our Asheville Brewery Tour! Babe and I have birthdays just two days apart, which we actually find pretty fun, because it means double the celebrating! We spent my birthday checking something off my bucket list (seeing the Biltmore at Christmas) and we spent his doing our own Asheville brewery tour . 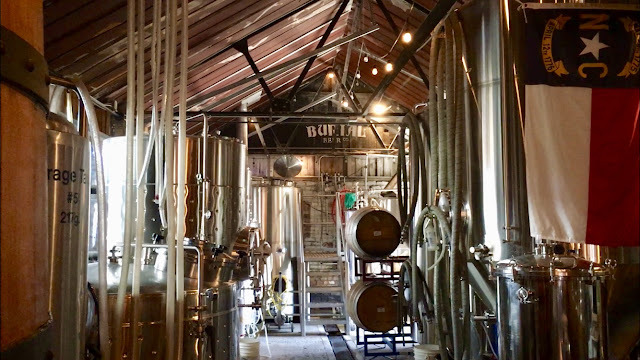 Asheville's brewery scene is hopping (pun intended)! There is practically a brewery of every corner. We chose five that were in pretty good proximity to each other and made a day out of it! This was our first stop of the day! The vibe was so fun and relaxed, with a Celtic feel to it. Green Man Brewery actually has two different spots you can enjoy a beer at, but we went to the original tasting room, as opposed to the new, bigger one right next door and really enjoyed being at their original location. **Tip: Green Man Brewery was a great spot to start our Asheville brewery tour, as it made a great parking option. Most of the city is metered parking, but there was a side street (it sits basically between the two buildings, but across the street, along a chain link fence) that was free to park on, which had a couple open spots. It was tight, but even our big old beast of a truck fit in fine. I personally really loved this brewery! I am not a beer drinker, but I am determined to try them and see if I can find one that I can at least drink. Burial Beer Co. had one of the best beers I have ever had. I still only got a half pour, but I am proud to say I finished the whole thing! They also reeaallly love Tom Selleck (he's on mural with Sloth from the Goonies) at Burial Beer Co., which was fun for the FRIENDS lover in my heart! Their outside patio is open and inviting, with a fun, old Ford you can play in. *The artwork on their cans is so fun! It was really hard not to buy a 6 pack just for that! Catawba Brewing Company won my vote for best location, because it was situated right next to Vortex Doughnuts; which has the BEST doughnuts and made for a yummy treat! It also had a gorgeous view of the mountains and a really unique, beautiful interior. We loved One World Brewing! It was the most crowded of the breweries, which was a downside for us, but it had the beers we like the best and a super unique, speakeasy type atmosphere. Tip: You have to be on the lookout for this one. We were originally a bit confused as to where the entrance was. 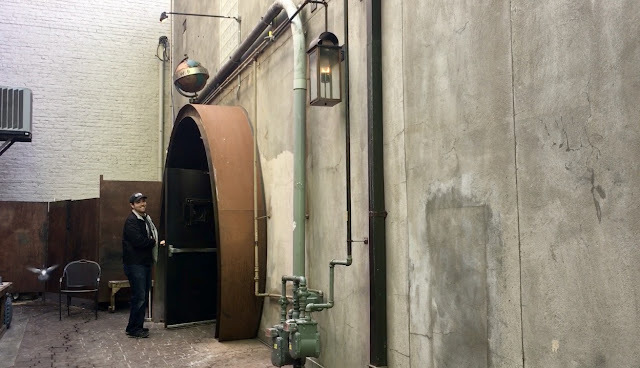 It's down a little alley between two restaurants and the entrance is towards the back of the alley. 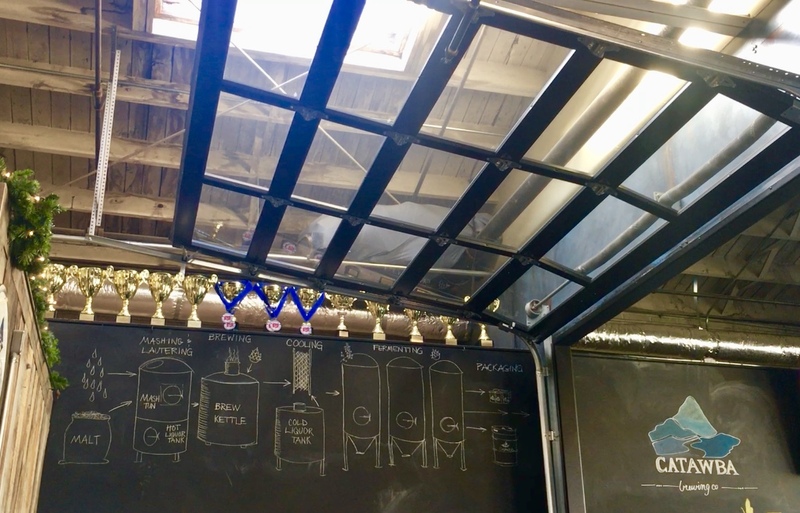 Wicked Weed Brewing was the final stop on our Asheville brewery tour! This was actually a good place to end the evening. Places were starting to get crowded, as it was closer to evening, and this spot had a large patio, with outside heaters. We were able to find a spot outside, away from the crowds, while still staying warm- score!! Bonus points- free pretzels and a yummy mustard dip! *I did do a small tasting of their Barrel Aged Milk and Cookies- not too shabby! We ended the evening by going on a hunt for good cocktails, so that I could find something that we knew I would enjoy. Y'all?! Curate! If you are looking for an awesome spot to end any day of brewery touring, food touring, shopping (ick! ), whatever your Asheville fancy is... then Curate is your place! I am a sangria snob (just ask every waiter who has ever had to answer- "Are you sure it's not spicy- meaning spiced with cinnamon- sangria?") and this place has amazing sangria! It was crowded, but we were able to order at the bar and take our drinks to a high top table. We loved it so much we went back a second time, when we back into the city on Christmas Eve to go to church. If you sit at the bar you can watch them carve the fresh meat for the charcuterie boards. The spots we hit for our Asheville brewery tour on Babe's birthday were all located in downtown Asheville and were an easy walk from one spot to the next. However, there are some great breweries on the outskirts of downtown that are also worth paying a visit to! Pisgah Brewing Company- This brewery was the closest one to our campground. It had a fun, hip feel to it. There is even a studio out back where local artist can come work. They actually have different artists design each of their new event labels and posters, which we thought was pretty neat. 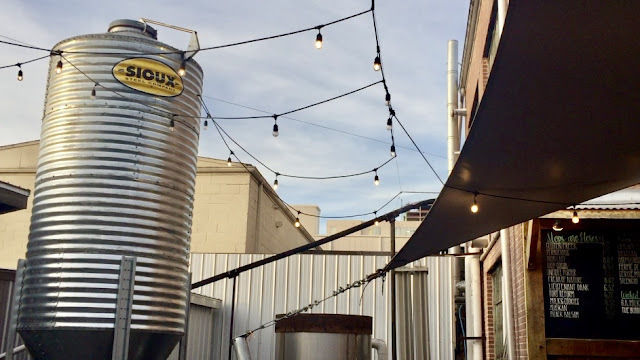 Lookout Brewing- This was actually probably our favorite little spot! Mostly because we really like more of the local vibe. Lookout Brewing was located about 5-10 minutes from our campground, in Black Mountain. They had games, an old school pinball machine, and the most unique flight arrangement we have ever seen (an we've visited a lot of breweries). They flight includes your four beer selections- written our for you on a poker chip, a little glass of pretzels, and a glass of water. 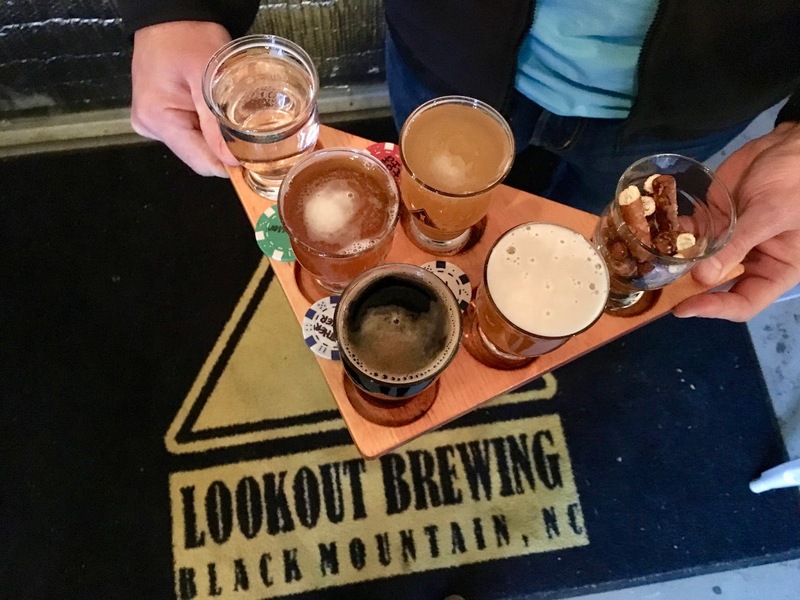 Lookout Brewing was definitely our most frequented brewery during our time in Asheville. **Bonus points- They had mimosas on Christmas Day!! 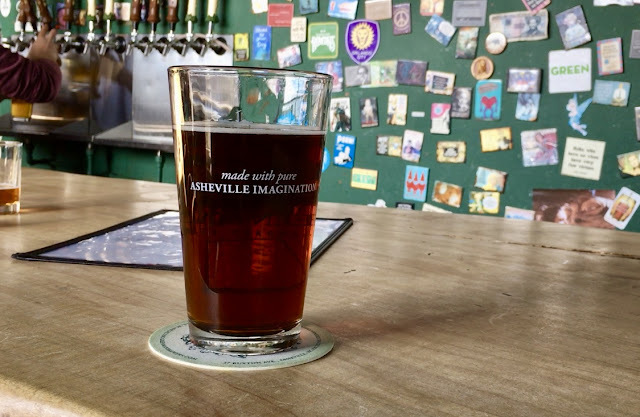 If you are ever looking for a great beer scene, Asheville is definitely your place! Where is your favorite brewery located?! Haha, it was definitely a super fun (i.e. funny) mural!! It's the same for me! Unless it's wine I really don't drink much, but still enjoy the experience all the same! Especially distillery tours that have such a fun history behind them! I don't like dark beers either! There were quiet a few lighter options, so it was a good experience for sure! Yes, you definitely should! It's a great day-venture! SO fun! This makes me want to go! You should!! It was a blast! I was very impressed by the fact that they have so many breweries in that town. The settings all looked terrific and your review was truly informative. We had no idea there were so many until we started researching a few to hit up; we didn't even get to half of them! Haha, thanks! Try to just enjoy each moment as best I can! All of a sudden I'm hearing soo much about Asheville! My boyfriend and I are big beer fans so I would love to travel down there someday! Yes, you need to!! There is so much to do, from beer to great hikes and yummy food; it's an awesome place! Sounds like a great trip! I visited Asheville with my family when I was a teenager...would love to go back now and enjoy some tasty beverages! I hadn't been in years either! It was so much fun exploring as an adult! We had no idea either! And it if reminds you of Bend then we definitely need to add that to our list. I'm sure we will love it! Haha, such a strange mix right?! But it was so neat! Haha, yes!! Always more doughnuts! That looks like such a fun day! We love trying new breweries when we're traveling. I definitely want a glass of that sangria too! YES! Sangria all the way!